James Schramko and Consulting Tycoon Kyle Tully discuss how local business owners today must recognise the major role played by the Internet in marketing. You can offer guidance to these businesses about having a successful online presence. Perhaps you can also make a living as a business services consultant…. 04:02 – What can Internet marketers do to profit from local businesses? 28:14 – A step-by-step guideline is not enough – think! James: James Schramko here and we’re always interested to speak to people in the business services industry because the internet is something that businesses cannot avoid. I was having lunch with a financial controller the other day from a large organization and he was extremely interested in everything internet because it’s become apparent that in his business, they need to be aware of it. And on the other side of the fence we have all these internet marketers who have the internet marketing skills but desperately need to learn how to talk to these businesses and how to communicate with them. So what I’ve done is I’ve gone out and get our repeat offender guest, I guess you’d call him. Kyle Tully, welcome. Kyle: Hey James, good to be here once again. How are you? James: Good. 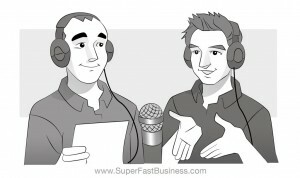 We’ve had lots of discussions before; we’ve put several interviews up on Internet Marketing Speed, you’re a regular contributor to my SuperFastBusiness community at SuperFastBusiness.com, you’ve spoken at the FastWebFormula live events. Always a popular session and I think that is because we are in the most amazing time where if you possess a fraction of internet marketing skills and you combine that with some business knowledge, you have a wonderful business opportunity to go out there and serve these businesses for profit. I’d love you to tell me firstly if you agree with that and secondly, what sort of things have you been up to with your consulting tycoon products and communities? Kyle: Yeah, I definitely agree with that. We’re certainly in a time, especially in the last year or two where businesses becoming a lot more savvy about the internet. Either progressing from not believing at all to realizing that they do need to do something about it and on the number level progressing from trying to do something about it to getting a lot more serious about it and starting to attract return investment and all these kind of stuff. So it’s a really good time for people like you and me who have some basic internet marketing skills and can take these to the offline world because they really are getting a lot more up to speed than they ever had before. Which is actually making it easier for us to do our jobs in terms of selling them because before we kind of had to educate them on the internet and really sort get them to take a chance on us and on the internet. Whereas now they see lots of other success stories. They really do realize the Internet is the way forward. It’s a very easy conversation to have with them, it’s a lot easier to get money and get good money out of them because they’re natural transitioning funds from other marketing activities to the internet and it’s now a choice of who they’re going to work with and what particular strategies they’re going to focus on rather than whether they should use Internet at all or not. James: Yeah, so I’m thinking of that bell curve where you have the innovators and then the early majority. The big fat part of the python is yet to come, the late majority and the laggards so I wonder what the changes are. If I think back to when we first met, it must have been something like 5 years ago, maybe 4 – 5 years ago. We were both dealing with customers. We were both doing this offline thing when it sort of hit the internet marketing scene. You’ve been doing copywriting and web development before that and I had been running a dealership but learning how to build websites. And you’re right. We did have to educate people and there wasn’t necessarily an awareness of it or an allocated fund. We’ve seen the changes now where businesses would even have a part of their marketing budget allocated to online media. What can we do as internet marketing experts to take advantage of that budget? How do we actually make it happen where that part of the budget gets directed into our bank account for providing a solution? What are the steps or the methods that we can use to make them aware of us and then the next logical step is for them to feel that we are the right person to be dealing with? Kyle: I think the main thing we’ve noticed more recently that’s becoming really critical, it’s really a business more than one thing but in the past we can get away with not having one and that’s a USP. That’s having some unique reason why someone should choose you over the competition. Now a couple of years ago it was good enough just to go in there and kind of pitch them on the idea of the internet and you kind of either get the job or you wouldn’t. It was relatively easy to do that. Even they had to educate. Whereas now, there’s lots of people saying you know the Internet, SEO, PPC, there’s lots of people with the same basic message of you need to be doing something on the internet. It’s becoming really important now to have some kind of unique reason why they should choose you to perhaps specialize in the particular area whether it be a particular market or niche segment, whether it be a particular type of result or particular strategy such as SEO, PPC and really work at being the best in your little small unique field. And then obviously the way you get in front of them is via marketing. That’s really what it comes down to, that’s the key drive that we’ve seen, it’s been the difference in people’s businesses between those who are having big success and those who are still kind of struggling is the ones who are getting really clear on exactly what they do, who they do it for and the solutions they provide and the benefits they give their clients. They’re the ones who are having a much easier time now. So we’ve spent a lot of time with my students on helping them craft USP’s and get clear on who they’re targeting and we’ve found once you do get clear on that, all the other stuff like marketing and copywriting and what to actually say becomes a lot simpler because you have a really clear idea of who you’re talking to and you can picture who they are, you can really think about the actual problems they’ve got not the sort of the generic problems of an entire market but the specific problems about this individual with his type of business. James: Okay, let’s just dig in to that a bit. What do you say to someone when they say, “Kyle, should we specialize in just do SEO or just do websites or just do PPC or should they be a one stop solution for the customer. How does someone know what they’re differentiation actually is? Kyle: There’s no right or wrong answer. Part of it comes down to the business that you want to create based on your own unique background and skills and specialties and everything. You only need to look at the market to see that there’s lots and lots of success stories both people who are very much generalist who provide everything from websites, to traffic, to conversion, to analytics stuff and everything in between. And lots of success stories of people who are very specialized whether they be just PPC experts or SEO experts, or only focus on one particular niche. So there’s no right or wrong answer to that. I think a lot of it comes down to you and the business you want to create. However you can whether you’re going to be a generalist or specialist, you can still target your marketing in a specialised fashion. Some of the most successful journalist I know they still have a USP based around for example something like Lead Generation. Something that is a common thread across many different markets in a lot of business sectors. They refer to their marketing problems as a lead generation problem. And so as much as this company might be a generalist in terms of the services they provide. They very much specialize in the messaging they use and the language they use. James: Love it. And I guess there are other things they can differentiate as well. They might specialize in a particular vertical like just serve one type of customer. Like one industry classification. Kyle: Yeah exactly. There’s lots of case studies out there and lots of good examples to model of people who have a very specialized business, whether it just be targeting dentist or just targeting lawyers or just about any other niche out there. That’s a fantastic way to go. We’ve got some good success stories dying to come out of our program for people who have specialized in that manner. It’s a simple thing to envision why it would be more successful that way when you think about you’re an accountant, you’re sitting at your office and you get two letters come in one of them is from a deal and or marketing company saying we help you grow your business and the other one’s from the accountant practice growth specialist, it’s no brainer for him which one feels like the more logical fit and you know in every niche we look at, there’s plenty of opportunity out there, plenty of clients who are willing to spend money. Most of our students are working with sort of 5 – 10 clients at one time. Most of the markets you look at there’s plenty of opportunity, plenty of prospects out there for you to target. James: In terms of devices that people could use to come up with the ability to specialize, I guess the thing that’s coming to my mind is a technique like using filters. For example my coaching in SilverCircle is kind of generalist. I can deal with most different verticals and I can deal with different types of industries but my filter is a cut-off point of the income or revenue that people should be generating before I would like to work with them because I know the sweet spot where I can really get a maximum result. So I would call that a filter. A filter’s useful in helping people differentiate in other words working out who they shouldn’t be dealing with. Kyle: Most definitely, some of my filters, the criteria I call them, that I’ve had for my business for a long time, my sweet spot so to speak have been businesses in the 2 – 10 Million dollar range. I found that in that range, they’re big enough that they’ve got marketing budgets, they’re spending money on marketing, they’ve kind of figured out how to sell their product or service. And it’s a lot easier for me to come in and ramp up what they’ve got going. I found businesses smaller than that are a little bit too chaotic, don’t really know what they’re doing, often don’t have marketing budgets to support what I want to do. And then businesses above the 10 Million dollar range in general there tends to be too much red tape, too many layers of management to deal with, too much bureaucracy. So I found that sort of range, the 2 – 10 Million dollar range is a really good one. I’ve also found things like if they’ve got a marketing department or a marketing manager can sometimes be a good filter. I mean obviously there are tons of other filters based around things like the actual business size; problems are a really good one, targeting a particular type of client with a specific problem. One of my students at the moment is specializing in conversion rate optimization, a particular type of people who are using AdWords to drive traffic. So already he’s got a fairly specialized niche. They’re targeting just 1 traffic source with just 1 service but he’s also going 1 level deeper and looking for people who specifically have problems with lead generation or the actual conversion of a single page and their website. So you can take it down to a very small level and even at that level, there are still literally dozens and dozens and dozens of prospects who fit that ideal client profile. James: Right, so what comes to mind for me is one of our services specializes in reputation management. We could even sub niche that into Reputation Management for Politicians or Reputation Management for Celebrities. We could really tailor around marketing just to talk to that specific person and I imagine that specific person hearing from us would really resonate with us thinking we are a good match for their problem. Kyle: It’s funny you mentioned reputation management. I’ve actually got a student who’s just niched herself into the reputation management for lawyers market, just started sending out her first direct mail campaigns ever the other day. She’s already gotten 2 responses from that, one of them was actually from a lawyer who doesn’t need reputation management but knows a whole bunch of other people who do. So just that power of saying I’m the specialist at this, can start generating lots of different results that you might not have expected like referrals and endorsements. It’s the least kind of things that if you’re a generalist there’s no way that same response would have happened. James: Perfect. Okay, we’ve covered the differentiation aspect of it; we’ve given some suggestions on how people can identify who they want to deal with and how they can show them. But what we haven’t really covered and I would love to dig into this more is how do we actually communicate with the prospect? How do we have them find out about us? How do we talk to them? What sort of mediums are we using? Assuming we can hang all our messaging around our differentiation, what’s the actual vehicle that gets us in front of the customer? Kyle: The way we get in front of the customer is basically by marketing. That’s really the vehicle that drives all of this business. I think Dan Candy said it best where he said, “We’re in the business of marketing our services not doing our services.” That’s really where the rubber hits the road. You can spend all this time deciding on the niche to go into and setting up all your criteria and filters and building a pretty website and all these kind of stuff. But until you actually start putting marketing campaigns out into the market and driving traffic to your website, putting direct mail campaigns to a list of people. Until you start doing that, you haven’t really done anything to grow your business and frankly this is where a lot of people really get stuck because it’s a huge mental leap for people to start promoting themselves. It’s a real big jump from sitting at home at your office saying I’m a marketing expert to actually putting a piece of paper out and sending it to someone saying I’m a marketing expert and I guarantee I can help grow your business. It’s a really big step, the lady I was talking about before has just specialized herself. She was telling me how she felt sick the night before she was sending out the letters. Worrying about what these people might say, calling her bluff, knowing that she’s getting started and all these kind of stuff and so it’s a big mental leap for a lot of people to get passed this. The thing I suggest to people is just get something out there. Even if you send just a one page letter to a prospect and just say, “Look, I had a look at your website and I noticed a couple of ways I can help you get more business, give me a call on this number.” If people just started doing that and did it on a consistent basis, they’d start generating leads, they’d start getting opportunities to have conversations with business owners and frankly a lot of the time that’s all it takes, a simple conversation. When you’re enthusiastic about what you do, when you’ve got a clear statement about who you are and who you can help, the problems you help them solve, the specific results you can help them generate. You get into a conversation with these people and they get caught up in it. That all starts from having these marketing systems in place and basically just doing the marketing on the day to day basis. Occasionally, they’ve tried maybe 1 strategy in the past month. That’s really the core of the problem. People aren’t marketing themselves enough and they’re not doing it consistently, they’ll try a direct mail campaign once and it won’t generate the results they were hoping and they’ll give up. So I think all of this stems from just having good habits around marketing yourself consistently. James: I can certainly relate to that core reluctance or feeling of someone calling your bluff when I started. It was particularly hard for me to record something or to put myself on video out on the internet at one point but after you go over that resistance, it just becomes as you said a habit or I like to think of it as a routine and then you know, try stopping me publishing stuff. I’m like a content machine now because I’ve overcome this fear that someone won’t like it. I know someone won’t like it, I know some of the material won’t be read or whatever but I’m not personally offended by it. But you’re right. The reason people aren’t buying things from a lot of consultants is because they don’t know they exist. James: Tell me about the balance between, I guess it’s almost a trap. We’re sitting there at our desk behind the computer, what sort of changes do we need to make, or what action steps would we have if we had a blank whiteboard sitting beside our computer here, what 2 or 3 items would we write on our checklist should we go away and do after we listen to this call if we want to go from a theoretical business service to an actual customer paying us money in the bank we’re in motion service? Kyle: I’ll tell you the biggest reality check that you can do for yourself and this has really been a wakeup call for a lot of people that I’ve spoken to is to… everyone talks about goal setting, most business say yeah I want to have a 6 figure consulting business. The most powerful thing you can do is take that goal that you want to do like you want a hundred thousand dollars in your next year and start breaking it down until you’ve got a daily figure. You know exactly how much money you need to generate each day. Also break it down, look at it, if my average client value is going to be $5,000 break it down and figure out how many clients you need to generate over the course of a year? And then break that down and figure out how many clients do you need each month, each week and then you can start to play with some numbers and figure out, okay, if I need for example 2 clients this week to hit my income target for the end of the year, and I convert say 10% of consultations into clients, that means I need to be doing 10 – 20 consultations this week to hit my targets. So breaking down those big picture goals that are kind of always out there in the future and bring it down to a daily target that you have so you can look at your whiteboard and say, “Okay, I need to generate 2 leads today on average to be able to hit my income targets for the end of the year.” Then your daily actions are taking you towards getting those 2 leads or they’re not. The reason this is so powerful is because people put that in a hundred thousand dollar number up on their whiteboard and it’s so big and it’s so far in the future that you can kind of always kid yourself that you’re making progress. You know you can sit there playing with your website and tinkering with the colors and the fonts and you can spend time in the forums learning about different strategies and buying new products and that hundred thousand goal is always out there in the future and you can do nothing today and sort of do a little bit more tomorrow and you’ll catch yourself up. But it’s not until you realize how many leads you need to generate on a daily basis and how quickly you fall behind if you don’t start generating those leads that it really becomes real. And you can really kick yourself in the bum and say, “Okay, I haven’t generated any leads this week, I’m already 20 leads behind where I need to be to hit my targets. That’s where it comes down to. Hey James, the link in the first paragraph ‘make a living’ is not working.